Counterintelligence at CIA today is a far cry from its Cold War world of Soviet moles or penetration agents and neutralizing them or turning them into double agents. Current CIA Director Mike Pompeo is working to change all that. Pompeo has elevated the status of CIA's counterintelligence center, a dedicated unit within the agency's Langley, Va., headquarters that is devoted to identifying and countering foreign intelligence agents and their activities. CIA counterintelligence efforts, however, remain limited by a lack of both qualified personnel and strategic vision needed to deal with a growing spy threat that today includes both cyber operations and influence activities, in addition to traditional spying by nations such as China and Russia. The foreign spying threat is increasing in both scale and sophistication, according to intelligence experts. As part of the reform, Pompeo is stepping up internal security at CIA in a bid to better identify leakers—employees who may be politically motivated to conduct more non-traditional digital-age crimes—such as exposing secrets in a bid to undermine American intelligence, or overall U.S. national security. "The director has made counterintelligence a priority at CIA because if we don’t achieve perfection in this realm, all our other efforts at the agency are at risk," said Dean Boyd, CIA director of public affairs. "The last thing CIA can tolerate is to have a secret we’ve stolen re-stolen." CIA's record of counterintelligence includes a string of failures. The list is long and but not well-known, such as the compromise and doubling of most of CIA's recruited Soviet-bloc and Cuban agents during the Cold War and similar rolling up of its networks in China. The CIA also was fooled by the Iraqi defector code-named Curveball who provided false information on Iraq's weapons of mass destruction programs. The data contributed to the decision by the George W. Bush administration to invade Iraq in 2003. A counterintelligence lapse in the war on terror also proved costly. In 2009, seven CIA officers and contractors were killed when an Islamic terrorist who penetrated the Jordanian intelligence service undetected set off a suicide bomb at a CIA base in Pakistan that was engaged in drone operations. A former intelligence official said the CIA missed counterintelligence signs indicating the terrorist who conducted the attack, Humam Khalil Abu-Mulal al-Balawi, was a mole, including links between members of his family and Islamic terror groups. Former intelligence officials say CIA's poor record for conducting counterintelligence is largely the result of a bureaucratic culture that once viewed the strategic anti-spying function as "sick think"—challenging the loyalty of intelligence officers within the agency. All intelligence officers must expect to endure such scrutiny in order to protect the secret activities that are the CIA's mission. The anti-counterintelligence culture grew out of the backlash against legendary CIA master counterspy James Angleton, who aggressively hunted Soviet "moles" or penetration agents within the CIA until he was forced out in an internal power struggle in 1975. After Angleton's departure, CIA counterintelligence was downgraded to a relatively minor support function, and the agency suffered a string of failures involving foreign intelligence agencies. The most recent involved China. The New York Times reported in May that the Chinese government systematically dismantled CIA spying operations in China beginning in 2010 and suggested, according to officials quoted in the story that the loss was the result of a retired Chinese-American CIA officer who spied for China. The loss of all the CIA's recruited agents was either the result of a Chinese mole that penetrated the agency's spy networks, or a sophisticated hack against the CIA's covert communications systems. The CIA spy hunting office also in the past was known as a bureaucratic dumping ground for less-qualified intelligence officers. CIA turncoat Aldrich Ames, a CIA counterintelligence officer who gave up the names of all CIA agents in the Soviet Union during the 1980s, was an alcoholic. His spying for Moscow led to the deaths of several CIA assets. Similarly, FBI counterintelligence officer Robert Hansen, who also gave up numerous CIA agents to Moscow before he was arrested, was known within American intelligence circles as "Captain Cuckoo" because of his bizarre activities and views. "CI in the agency today is basically vetting agents through database searches," said one former CIA officer. CIA counterintelligence grew out of World War II and the agency's wartime predecessor, the Office of Strategic Services that set up its X-2 counterespionage branch. The Americans learned most strategies and tactics for doing counterintelligence from the British. The X-2 was an elite unit staffed by the best and brightest U.S. officers. One of its main jobs was helping protect the secrecy of the captured German Ultra decoding machine obtained by the British. Ultra was credited with helping win the war by knowing intimate secrets of German military communications. After the war, X-2 became the center of CIA counterintelligence under Angleton and deputies Scott Miler and Ray Rocca. All three leaders of what was called the CIA counterintelligence staff were regarded as expert intelligence officers and operated largely independent from the CIA's clandestine service, the unit in charge of overseas spying. Boyd, the CIA official, said under Pompeo the CIA has revitalized efforts to detect, neutralize, and exploit counterintelligence threats. "Among other things, the director has elevated the status of the Counterintelligence Mission Center so that it reports directly to him," Boyd told the Free Beacon. "The move has sent a message both internally and externally that counterintelligence is a top priority at CIA." The counterintelligence center is one of several CIA centers that is made up of both analysts and operations officers from CIA along with counterintelligence officials from the FBI and other agencies. The CIA website said the mission center protects CIA operations from being compromised by foreign adversaries. "To do this, CIC analyzes the capabilities, intentions, and activities of foreign intelligence services," the website said using the acronym for Counterintelligence Center. The center advises Pompeo and other agency elements on counterintelligence and counterespionage objectives, strategies, and resources. 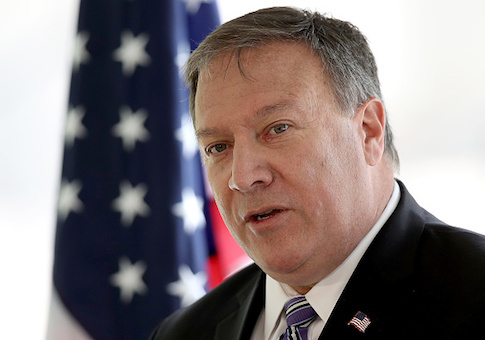 Placing the counterspy center under the director has allowed Pompeo to put his stamp on how CIA carries out the CIA mission, Boyd said. One relatively new mission has been to focus counterintelligence more on threats posed and insiders who decided to turn on the agency by disclosing its secrets, such as renegade National Security Agency contractor Edward Snowden. "CIA also has enhanced its training and education of the workforce on CI issues, using new messaging channels and other communications to ensure employees are more aware of CI threats from both inside and outside the agency," Boyd said. A senior Justice Department official told the Washington Free Beacon recently the department is pursuing leakers who disclosed highly classified information early in the new Trump administration. In August, Attorney General Jeff Sessions announced the department is aggressively pursuing leaks of classified information and had tripled the number of unauthorized disclosure investigations than those conducted under the previous administration. A report by the Senate Homeland Security and Governmental Affairs Committee made public in July decried what it called "an avalanche" of leaks from U.S. officials. Between January and May 125 leaks were reported in news outlets, mostly related to Russia and including information from electronic intercepts, FBI interviews and intelligence, grand jury subpoenas, and a secret intelligence court. "Other leaks disclosed potentially sensitive intelligence on U.S. adversaries or possible military plans against them," the Senate report said, including one leak that caused a diplomatic spat between the United States and a close U.S. ally. The press disclosures also included secret electronic intercepts of conversations between Trump's first National Security Adviser Michael Flynn and Russia's ambassador that led to Flynn's resignation. Trump's conversations with two foreign leaders were also leaked. The Washington Post in August disclosed transcripts of Trump's private phone conversations with Mexican President Enrique Peña Nieto and Australian Prime Minister Malcolm Turnbull. The newspaper said it published "reproductions" of the original documents "in order to protect sources" widely suspected of being former Obama administration officials who stayed on during the Trump presidency. In the cyber realm, CIA also suffered major counterintelligence failures when numerous CIA hacking tools were stolen and published by Wikileaks. Pompeo has targeted the anti-secrecy website WikiLeaks in public remarks as a "non-state hostile intelligence service" that has targeted U.S. spy agencies in attempts to infiltrate the agencies and steal their secrets. The CIA director told the Free Beacon in July that groups like WikiLeaks run spy operations, hire people, and conduct counterintelligence of their own. "So when you stare at them for a while they look all the world to be an intelligence service," he said. "They have all the central functions. They do intelligence collection. They run operations. They have a support structure. They look and smell like an intelligence service and we should treat them as such." Asked whether non-state groups have been caught trying to penetrate CIA, Pompeo declined to comment but said, "these services will do anything. They'll offer a bounty for information. This is in the finest tradition of intelligence collection but from a very different motive force and from a very different space. They're unanswerable to anyone in the sense of in nearly every country you have a set of citizens to whom you have to answer to one degree or another depending on where you sit in the democratic order of things. These are free-range chickens." At a conference last month, Pompeo said, "one of the things I have put an enormous amount of my personal attention to is counterintelligence." He said allowing CIA secrets to be "re-stolen" is unacceptable and the agency has a duty to protect its secrets and "to go after those who stole them and to prosecute them within the bounds of the law in every way that we can." "I sometimes hear comments from WikiLeaks and [WikiLeaks founder Julian] Assange thinking that those who have provided him classified information are safe and secure," he said. "He ought to be a bit less confident about that because we're gonna go figure out how to make sure we protect this information—we owe it to the American people and our officers are dedicated to it." Ursula Wilder, a clinical psychologist at CIA for 21 years, stated in a recently-published CIA journal that leaking is "an age-old feature of political life and will remain a permanent fixture of any democratic society with a free press." However, the digital age has made the problem more difficult to deal with for intelligence officers. "Today’s intelligence officers know they are serving in tumultuous, exciting, astonishing, and dangerous times," she stated. "In every generation, a few insiders have chosen the destructive path of betrayal and harmed themselves, their families, their nation, and many others who trusted in the United States to keep them safe," Wilder wrote. "Three things keep loyal insiders going when news breaks of another case of espionage or leaking by one of our own: our personal commitment to our mission; our bonds of trust with our colleagues and teams; and the example of the generations of patriots who served before us, who also weathered betrayals by some of their own. So we keep faith, serve the Constitution with integrity and to the best of our abilities, and expect to pass the torch on to a new generation of officers who will do the same." This entry was posted in National Security and tagged CIA, Mike Pompeo. Bookmark the permalink.